Beautiful bundle, the coat, gilet and skirt are age 3-4 but big fitting, the rest is age 4-5 but it all fit at the same time. There are a couple of paint stains on the floral leggings but they still look lovely on so I've included them and there's also a mark inside the gitlet but you can't see it when it's on. The rest is all in great condition, the coat was worn once!! Dispatched with Royal Mail 2nd Class. BNWT Age 3-4 Girls NEXT Coat. Condition is New with tags. Dispatched with Royal Mail 2nd Class. 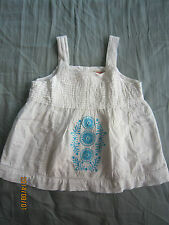 Pretty tunic top for age 3-4 years. 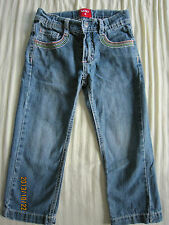 Girls 3-4year Jeans. Condition is Used. Dispatched with Royal Mail 2nd Class. These do have adjustable waist. Will happily combine postage on any items purchased. Girls 3-4years Denim Shorts. Condition is Used. Dispatched with Royal Mail 2nd Class. 1 pair is h&m (damage to the elastic in adjustable waist but it's only frayed doesn't actually effect the use of elastic & can't be seen when not pulled out as seen in pictures 1 is pulled out & 1 is when it isn't ) Other pair is Denim Co. These also have adjustable waist. Will happily combine postage on any items purchased. Lovely girls Next jacket age 3/4. Ideal for holidays or casual wear. With 2 button fastening and 2 pockets this jacket is fully lined. From smoke free pet free home. No bids outside uk thanks. Lovely bundle of summer clothes all in very good used condition Pic 1 Swim vest and shorts with UV50 age 3-4 Next Pic 2 sunglasses print playsuit age 4 Next Pic 3 pink tiered dress age 6 (but small) Next Pic 4 palm tree green dress age 5 Next Pic 5 coral dress age 4-5 Next Pic 6 joules stripe dress age 3-4 (quite generous) tiny mark as shown in pic 7 Pic 8 stripe dress age 4-5 Next Pic 9 tie dye dress by Kaisely age 5-6 Pic 10 green cardigan age 4-5 Next Pic 11 straw hat age 5-6 Next All these fitted my daughter when she was 4-5 Dispatched with Royal Mail 2nd Class. NEXT GIRLS FLORAL DENIM JACKET. AGE 3 TO 4 YEARS. Girls Next Joggers 3-4. Condition is Used. Dispatched with Royal Mail 2nd Class. BNWT Next 4 Years (3-4) Pale Pink Sequin Embellished T-shirt RRP £12. Tesco party skirt. Girls Age 3-4 Years. Good condition. Size 3-4 years. No smoke no pets. Very good condition. Size 3-4 years. (1) NEXT BROWN FLIPPY COTTON SKIRT WITH ELASTICATED BACK SEAM AND HEAVILY CROCHETED FRONT WAISTBAND. THE SKIRT IS PLEATED UNDER THIS WAISTBAND SO REALLY IS QUITE A FULL SKIRT. NICE CHUNKY TIE BACKS. 3 Pairs Girls Leggings -3./4. Condition is Used. Dispatched with Royal Mail 2nd Class. Girls Funny Raincoat Age 3-4, Next. Immaculate condition, like a new. Dispatched with Royal Mail 2nd Class. E xc el le nt c on di ti on. Girls Age 3-4 Years Denim Skirt. 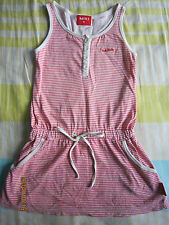 Girls 3_-4yrs Pj Bundle. Good used Condition x5 Pj all from George, asda. Includes all in one with hood fleece snowman theme, x1 set Xmas pjs smoke free Dispatched with Royal Mail 2nd Class.